Which EC2 Availability Zone is Affected by an Outage? 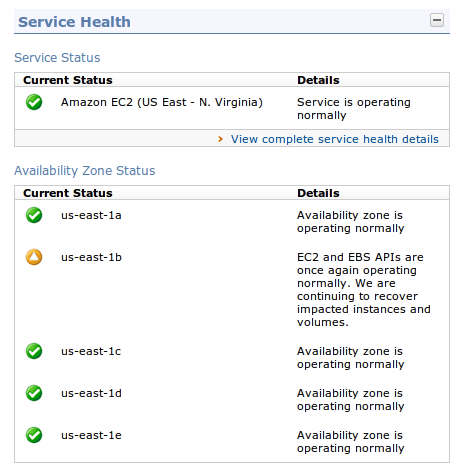 Did you know that Amazon includes status messages about the health of availability zones in the output of the ec2-describe-availability-zones command, the associated API call, and the AWS console? Right now, Amazon is restoring power to a “large number of instances” in one availability zone in the us-east-1 region due to “electrical storms in the area”. Since the names used for specific availability zones differ between AWS accounts, Amazon can’t just say that the affected zone is us-east-1c as it might be us-east-1e in another account. Here is the output for one of my accounts showing that the zone is named us-east-1b. AVAILABILITYZONE    us-east-1b  impaired    us-east-1   EC2 and EBS APIs are once again operating normally. We are continuing to recover impacted instances and volumes. and here is the output for another account, showing that the zone is named us-east-1c. AVAILABILITYZONE    us-east-1c  impaired    us-east-1   EC2 and EBS APIs are once again operating normally. We are continuing to recover impacted instances and volumes. Since the availability zone status information is available through the command line and API, has anybody written plugins for Nagios or similar monitoring software so that we can send alerts to our teams when Amazon marks availability zones as impaired? Update 2012-06-30: Jim Browne has taken the challenge and created a Nagios plugin for ec2-describe-availability-zones.